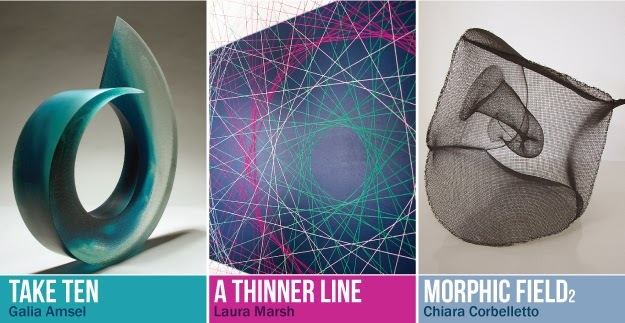 Corban Estate Arts Centre's latest exhibitions feature artists Laura Marsh, Galia Amsel and Chiara Corbelletto. These three exhibitions are on display from 7 March till 13 April 2014. A Thinner Line is an installation of artworks by Laura Marsh that collectively consider the line between life and death. Marsh’s latest exhibition features new works developed during her time in Colombia, South America on an artist’s residency. Internationally acclaimed glass artist Galia Amsel’s survey exhibition Take Ten, showcases ten cast glass works. These works represent ten years of making since leaving the UK and settling in West Auckland. We see the fundamental influence the surrounding landscape and climate has had on Amsel’s evolving glass practice. Chiara Corbelletto’s Morphic Field 2 presents a series of floating and ethereal sculptural works, visualizing how forms may emerge from space. Corbelletto’s selection of sculptures are inspired by current theories in physics, and transformed by the idea of a unified field of potentiality as the ultimate fabric of reality. On offer is a full range of free art gallery activities. Auckland based artists Galia Amsel and Chiara Corbelletto will give artist talks at CEAC’s Open Arts Day Saturday 29 March at 11am and 2pm. Laura Marsh will be making string drawings at her kids workshop Saturday 5 April, 11am. All materials provided, no bookings required. Galia Amsel Floe 9, (2011, Courtesy of Masterworks Gallery. First is Last, Last is First is a new series of large scale portraits by Auckland based artist, Sam Mitchell. There are a few central influences in this series –fairy tales, cartoons and comics, current affairs, socio-sexual politics and popular culture, death and beauty. The series is insightful and imaginative, playful and humorous with the familiar tattoo imagery and 1920’s and 1940’s images overlaid on faces giving the works the layered look of a screen print, a discipline Sam learned at art school. 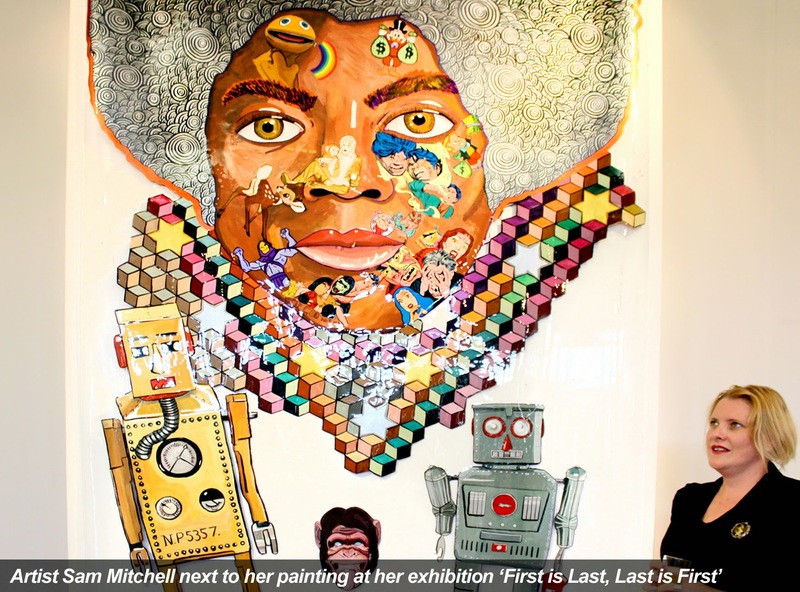 Mitchell is a collector and recycler of pop culture images; she has collected her eclectic motifs from multiple sources: tattoos, movies, magazines and the internet. These are transformed into loaded narratives and scattered across floating heads of people, famous and unknown. The paintings are created through a technique of painting acrylic backwards and in reverse usually on a perspex sheet to get a slick glossy finish. This is a demanding technique which requires the last touches to be made first and the background, which is normally applied first, last. This process which most would struggle with comes naturally to Sam, who is dyslexic. Portraiture and collaging of images has consistently been the subject and mode of working for the artist. Art critic Warwick Brown says, “She is a figurative artist with an obsessive drive to create images” 1 Mitchell describes her works as “Portraits from the inside out”. The portraits share a tattoo parlor aesthetic with the eclectic motifs tattooed on the paintings reminiscent of cartoons or comics. It is important for Mitchell that the viewer “owns” the works and brings their own narrative to the pieces. The surface is littered with loaded images making it easy for the viewer to construct their own fairy tale, imagined history or narrative. Mitchell is giving us her view on the world. She can’t tell us how to look, it is up to us to interpret it as we wish. Sam Mitchell currently lives and works in Auckland. Mitchell has exhibited works nationally and internationally in private galleries as well as public art institutions. Recent solo exhibitions include: Hip (Bartley and Co, Wellington, 2013), Members Only (Melanie Roger Gallery, 2012), Glean (Melanie Roger Gallery, 2011), Time May Change Me (Anna Bibby Gallery, 2010) and Samantha Mitchell (Newcastle Regional Gallery, Australia, 2010). Mitchell has received many prestigious awards for her work including the Paramount Award at the Wallace Art Awards (2010) allowing a six-month residency at the International Studio and Curatorial Programme in New York. Additionally Mitchell has been featured in recent publications such as Warwick Brown’s Seen this century: 100 contemporary New Zealand Artists: A Collector’s Guide (2009) and Richard Wolfe’s New Zealand Portraits (2008).2. 2010 Wallace Art Award winner, Sam Mitchell talks about her latest exhibition First Is Last, Last Is First, and her artist residency in New York. This is a free event, no bookings needed.